When it comes to internet marketing, many law firms overlook the importance of social media marketing. It has always been a stereotype that lawyers only have to be consummate professionals and cannot post memes and other entertainment content. 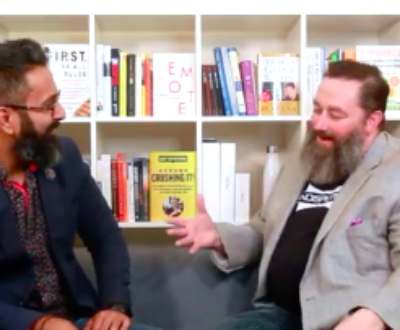 There are so many opportunities for lawyers and attorneys to show off their thought leadership in the legal world on social media pages and communities. There are quite a few benefits of using social media for legal businesses. But, to the flip side to having pros, lawyers face a host of challenges related to acquiring new clients, increasing online presence, and being socially active on social media channels. Small practices rely on social media to acquire new leads. To have a successful social media platform for your legal firm, you need to overcome certain social media challenges. There are many conflicting advice available on the internet about social media marketing that leave many attorneys and lawyers confused. Due to which many problems may arise. These are a list of some bottleneck challenges of social media that legal businesses can overcome. Legal businesses are marketing a service and not a product, which can make it difficult to determine returns on investments. Marketing a product is easier compared to a service. A client can see the product before deciding to purchase it. Images and videos posted on social media pages about the product, its usage, the packaging, presentation, etc. can compel the customer to purchase the product. Service, on the other hand, are not tangible, making it more difficult to promote and sell than a product. Products tend to be materials that customers look for when they need or want something. Some companies use this “need” and create USP for their products, making it easier to sell it. Legal advisors, attorneys, lawyers provide legal advisory services that cannot be seen and your clients won’t have the full confidence to trust you based on the first meeting. Legal businesses have the biggest USP for their services and that is — customized legal advice. You could create your USP for your law firm that separates you from the other legal businesses. 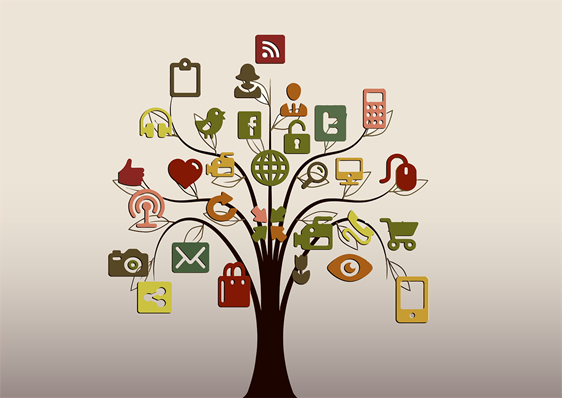 Therefore, you can post content on social media that builds trust among your target audience. Selling and branding products can have multiple content posts for multiple product segments. For example, hair care product manufacturers can market multiple kinds of products in multiple ways for various customer needs, engaging the viewers differently. Legal business services, on the other hand, typically have fewer options as they sell a few legal services. In fact, some small businesses may specialize in just one type of legal service. It becomes harder to promote and sell the reputation and value of a single service compared to the benefits and qualities of many different products. Although this may seem as a challenge, it can be converted into an advantage for law firms. The social media posts for legal businesses can be created with topic specific details that answers all the queries of the reader. Legal firms can engage with their social media followers by posting creative content and adding various content formats as their social media posts. People use social media as a distraction from their daily chores. When a person thinks of hiring a lawyer, it is usually associated with a serious problem or a serious situation. This is exactly contradictory to why people use social media in the first place. Not many people would search for answers to a legal problem on social media platforms. Yet another challenge of social media for legal businesses. Lawyers, apart from being intellectual in their job, should be witty in their content generation for social media posts. It is a challenge to stand out among the other entertainment firms that are constantly shouting on social media platforms about their products. All that lawyers gotta do is, do it differently! Sarcastic and pun-intended posts such as memes can be a good idea. But, as a legal firm, you need to wire-walk between posting smart content that conveys your message to the readers without losing professionalism. 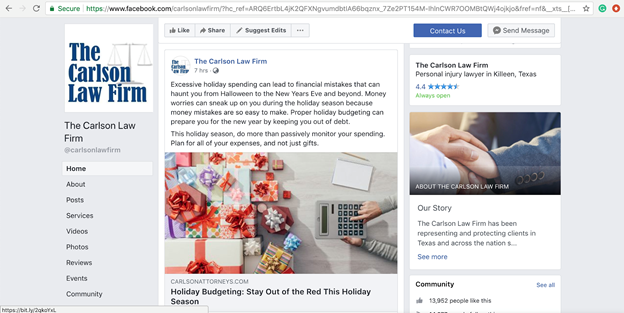 Just like how The Carlson Law Firm has done social media right. Not only are the posts witty and relatable to all customer segments, but the Facebook page also mentions the typical response time. That’s how they have overcome the challenge of standing out! Maintaining an active social media presence through various favored platforms like Facebook, Instagram, Twitter, etc. along with personal blogs attract new business leads and increase your client base. However, lawyers can face time-constraints in managing their work and posting good content frequently on social media. There are certain businesses that can manage your social media accounts for legal businesses. If you choose to go solo on updating your own social media pages, there are several ways you can streamline this process. You can always use automation tools such as Dlvr.It and Buffer to schedule your posts in advance when you create them. You can keep a calendar for your scheduled posts so you don’t have to keep track or log in to each account every day. You can also use programs like Hootsuite to centralize your social media networks. Using Hootsuite, you can post to multiple platforms simultaneously and do much more. One of the basic problems with social media marketing is the continuous need for updates and posts. If you leave your website or your social media platforms static or inactive, your existing clients will assume that your business is no longer exsiting. Ghosting on social media pages doesn’t bring new leads and doesn’t engage the older customers either. Posting content on your pages frequently, keeps your viewers updated about legal information, service information, legal advise, your thoughts as a lawyer, etc. Many law firms choose to outsource their marketing services to companies that specialize in SEO, website creation, and social media content. There are several strategies for maintaining an active online presence on social media for legal businesses. With curative content, your viewers can grasp your expertise in the legal business and comment or direct-message about their specific legal queries with you. Similarly, you could answer the frequently asked questions on your news-feed. This would attract more leads as their questions would be answered, compelling them to get in touch with you. Multiple social media posts on your legal business’ social channels will attract new leads and customers to your page. The existing clients may leave feedback over your website and your social media pages. With this, many firms can get carried away and end up staying stagnant on social media. Having consistent brand tone can generate loyal followers of your brand; just like how products have! Are your followers seeing the same thing everytime they see you online? Do they see the same branding and professionalism you mention on your Facebook or Twitter pages compared to what they see on your official website? Keeping brand description, profile images, biography, company information, and vision message consistent is necessary to create a brand identity on social media. Social media is a powerful tool for law firms and solo attorneys having their own practice. 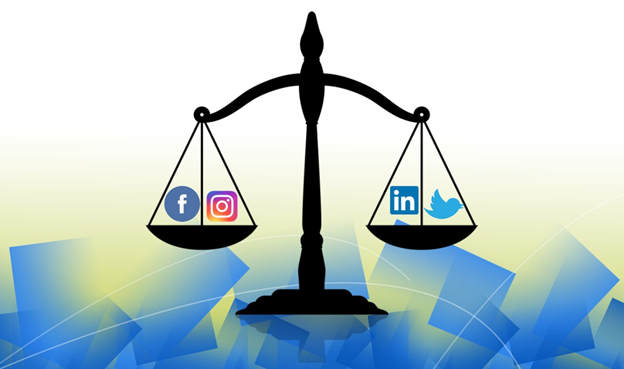 Social media for legal businesses has a good scope for marketing only if the platform opportunities are leveraged correctly by mitigating the legal and ethical risks. Let’s take a closer look at how law firms can use social media safely and successfully. Social media for legal businesses need to have unique content that relates to the client’s problems as well as address the potential clients about their service. Developing an authentic voice for your content and posts will eventually become your way of communicating with your audience. Unique content attracts new leads more than the traditional typical service post. Standing out among other service companies attract the kind of attention your content needs on social media. Dig deep into your legal firm’s culture, mission, and vision to find your unique voice for your social media posts. Content can help your business gain customers’ attention in so many ways. Having minimalistic but logical posts about why legal services are needed can already begin discussions and debates on a community page. Simply posting relatable content can start a fire on your social media page. Time is the most valuable resource for law firms. If you are spending a lot of time on social media for legal business marketing, you would ensure that you receive good returns on investments. While starting a social media campaign, you need to reach prospects but don’t have to sound promotional to do so. Set SMART goals for your legal firm. For example, rather than having a goal to increase your social media followers, re-phrase your goal to “increase Twitter followers count by 10% over the next 60 days”. This is more specific and measurable to only one account along with having a time-frame, making it easier to focus on. Such social media strategies benefit your legal business if the goal is mapped out from the start. Don’t settle for just one ideal social media channel for your legal firm. Experiment with multiple platforms but find your ideal platform where you gain more followers and your content is viewed the most. It’s important to identify the right platforms so that you invest your resources, time and efforts in the right place. Lawyers use LinkedIn the mostly for professional purposes. Nearly, 90% of lawyers are known to have a LinkedIn profile and 45% of traffic to law firm websites is driven from LinkedIn. Next is Facebook at around 40% of lawyers having an account, followed by Twitter at 26%. LinkedIn is a useful platform in networking and highlighting your legal firm’s experience in the field. Create a company account for your legal business, add your descriptions and logo, and share articles and news relevant to you and your clients. Your LinkedIn profile can function as an ideal referral source for your law firm and your existing clients can also endorse the work you do. Endorsements by existing clients can help you get more clients for your business. Facebook is a preferred platform for sharing cultural and professional content both in the form of images, GIFs, videos, blogs, etc. Having a Facebook account and posting on your company page can initiate discussions which will give you awareness about the needs and thoughts of your follower base through its analytical data. In fact, every social media platform provides analytical data about their business page performance. Building an authentic social fan base, which can help build trust in the minds of prospective clients. Demonstrating your expertise in the field by posting knowledgeable posts. Providing live-chat access through Messenger with your existing clients. Having reviews on your page can help establish trust between you and potential clients. Running Facebook and Instagram advertisements. While the percentage is lower than LinkedIn and Facebook, having Twitter accounts can also benefit your legal firm. Twitter is a great platform to network in real-time where you can know about what other law firms are doing or blogging about. Through Twitter accounts, you can follow clients, lawyers, and other professional influencers. You can re-tweet their content and posts to show your interest, while also sharing your own thoughts and experiences. Likewise, you may also receive re-tweets from other firms over your educational posts, thus help you to generate new leads. Answer people’s queries, even if you’ve answered them in an FAQ on your official website. Look for questions people are asking on other sites like Quora or Reddit. Address and clear common myths about legal services or law. Share your knowledge about new laws or recent events to update your clients and followers about the law and regulations. To get the most out of your social network, you will need strategies to interact with people online and get more leads. You can either decide to manage your social media all by yourself or you can simply hire an online marketing and lead generation service provider to help you out. Your legal firm could be one post away from a new follower, and potentially, a new client!